If you are a natural bodybuilder or a fitness enthusiast who wants to improve your body naturally, you need quality information from someone who’s walked a mile in your shoes. You need the guidance of a life-time natural bodybuilder. Sadly, you’re unlikely to get sound instruction from those who’ve relied on steroids to build up their bodies. Why? Think about that: If a trainer couldn’t find the wherewithal to build natural muscle and resorted to steroids instead – how is that person going to accurately instruct YOU in natural muscle building? Additionally, how will they adequately motivate you if they obviously couldn’t motivate themselves to make it happen without drugs? … But I’ve gotten around that. And I’ve done it by adopting contrarian bodybuilding principles. These discoveries are what make the training tips and techniques I have for you truly unique and effective. But I only discovered these principles because I’ve really been a life-time natural bodybuilder. While many others were experimenting with anabolic steroids, growth hormone, and other bodybuilding drugs, I was experimenting with what REALLY works for natural muscle and strength building. And since my trustworthiness in this context is important to you, I’ve decided to sit down and take a polygraph test to show anyone in doubt that I truly am natural and always have been. 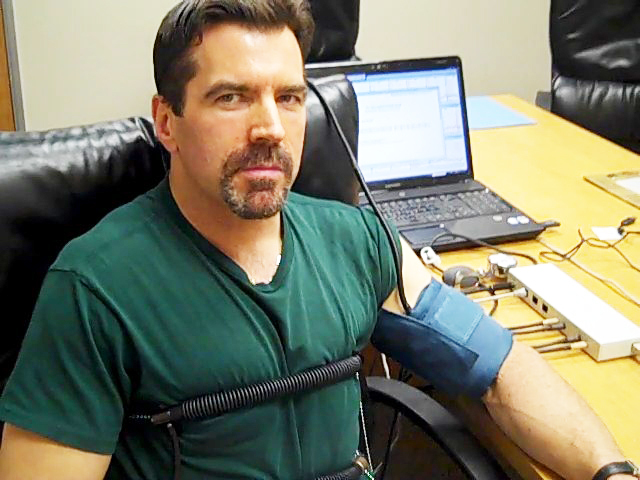 Why should Muscular Fitness Trainers who claim to be natural take a polygraph test? Because frankly – it’s too easy for them to lie. It’s too easy for them to build muscle with drugs and then deny that they did it that way. Am I saying it’s wrong for someone to use steroids? No… not at all; that’s a personal decision. And it’s very difficult to even place in a bodybuilding contest when the competition is all using steroids. So I feel for bodybuilding competitors. Yet… if a former steroid-using bodybuilder is now training YOU and you’re a natural trainee, the trainer can easily lead you astray due to unawareness of his own ignorance. I’ve seen this countless times. And adding to the likelihood of this is the fact that many of these trainers haven’t gained any muscle since using anabolic steroids. It’s no surprise why many people who hire personal trainers don’t get the results they’re seeking. It’s equally unsurprising that many people get lackluster results by following advice in books written by former steroid users. I met up with certified polygraph examiner, James Black. Mr. Black has worked for the U.S. Air Force Office of Special Investigations, the U.S. Department of Justice, and the U.S. Department of Homeland Security. He’s been trained by the FBI and has over thirty years of law enforcement and polygraph experience under his belt. Do you develop your body through natural means? Have you used illegal substances (steroids/hormones) to enhance your body? Are you a life-time natural bodybuilder? As you can see, I passed this rigorous test with flying colors. It’s easy to do when you really have built every ounce of your muscle through natural bodybuilding training.